Psst! I’ve got a secret to share. Next Tuesday, 15 travel bloggers, including EllenBarone.com, will put on their Santa hats and will give away prizes in celebration of the season. Prizes range from hotel gift cards and overnight stays to digital cameras and noise-cancelling headphones to luggage and camera bags to travel guidebooks and DVDs. Each day, between December 1–15, a different travel expert’s blog will be featured in this round robin event. You’ll have a chance to win one of over a dozen prizes by reading and commenting on the daily blog post. Simply visit the Luxury Cruise Bible blog each morning to learn about the featured Caravan “stop-of-the-day” between December 1 and 15, and then enter to win. Magellan’s Travel Supplies is a sponsor of this event. Check out the unique gifts available at Magellan’s website for all the travelers on your holiday shopping list. 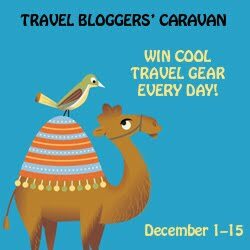 If you love exploring new destinations and revisiting old favorites, you won’t want to miss the Travel Bloggers’ Caravan & Giveaway! You just may discover a few new favorite travel blogs. Mark your calendars for Tuesday, December 1 and return to enter the first giveaway.